One of the first photos I took at Fairview PS, my new school. The possibilities of this beautiful space, with its natural climbers and magnificent willow tree, made me excited for the new year to come. It's been a long while since I've sat down to write in depth about my teaching and learning in Kindergarten. This past year was filled with new challenges and new opportunities as it was my first year at Fairview Public School. I must acknowledge that although the year brought many challenges (including the largest class I've taught to date, at 33 students by spring), I feel like I won the lottery in terms of my amazing teaching partner, Katie. I plan to introduce her here, some time soon. Today, though, I was thinking about the year we had together with our wonderful students and families, and trying to distill what it was that made it such a rich learning experience overall. 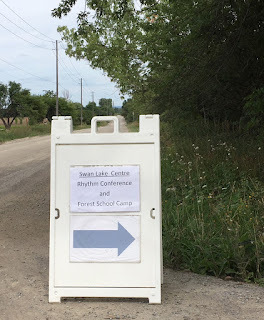 In part it was the warm welcome from the families; being an outdoor and inquiry-focused educator requires some early outreach (documentation, back up with research in the form of articles and the Kindergarten document) to allay fears around risks, discomfort with being wet or dirty, plus concerns about the academic value of such learning. In late fall we invited our families to join us for a community walk through our beautiful neighbouring park. 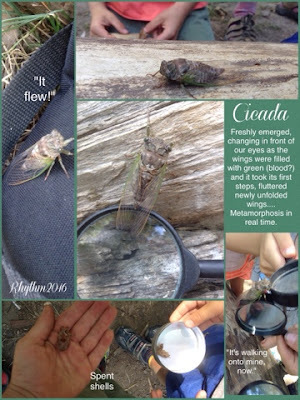 This turned out to be such a popular and successful experience, in which our students highlighted just how much they knew about their living environment, that it turned into a highly-anticipated monthly event for the rest of the year. This, too, deserves its own post. 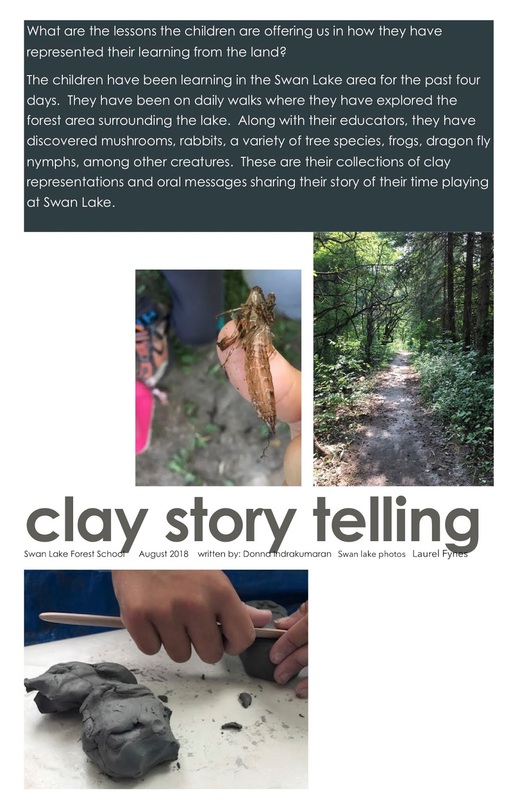 For now, when I try to distill the biggest overall impact of the outdoors, I know that much learning occurred over the year by individual student passion projects and small group inquiries. 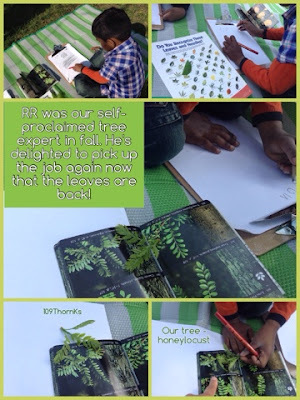 Larger studies were documented and shared with the whole class such that every student had a story sometime in the year in our bird or tree inquiry documentation books, for example. But to choose a moment that touched the whole class, I have to think of times when emotions ran high and students were compelled to communicate their distress or amazement with the larger community. There were several such occasions over the year, all in response to something witnessed while outdoors. These moments happen every day, all around us. The magic is in the noticing, and that's the skill I work the hardest to instill. A view of the school as seen from Kariya Park: just beyond our fence exists this magnificent oasis with ducks, turtles, many birds, beautiful ponds and gardens, all surrounded by walking paths. Part of what made leaving a school and team I loved was knowing my new class would have this wonderful place to explore. Being in a new school meant learning the affordances of the outdoor space along with our students. New to me was a yard small enough to necessitate a plan for sharing with other classes. Due to our large classes and overall proportion of the school population (six classes of more than 30 students each), we were unable to use the school yard during e-breaks (2 40-minute periods) when the older grades were outside. 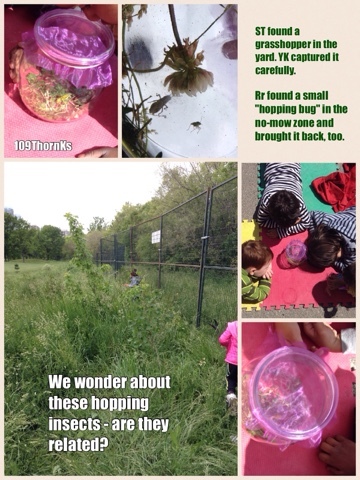 This presented a welcome challenge: how could we maximize our outdoor time over the day? Before finding creative ways to extend our time in unused spaces, however, there was another new challenge for me. In order to have equitable access to the limited outdoor tools and equipment, the Kindergarten team had a structure in place to rotate classes each day through 4 distinct spaces around the yard: a hard-top area with wheeled toys, a fenced-in "pen" with balls, building toys and games, a playground structure with some shade provided by pines, and an area known as "the meadow" in which the log and stump remains of an enormous ash tree provided an inviting climber. My first thought upon learning we had to follow a schedule was along the lines of mutiny, but I was eager to make a good impression on my new team, and trusted my new partner's thoughts about how well it can work. Of course, she was right: the rotating schedule wound up providing opportunities to get to know each of these spaces intimately, and as such children began to make good predictions based on their knowledge of these mini-eco-zones. 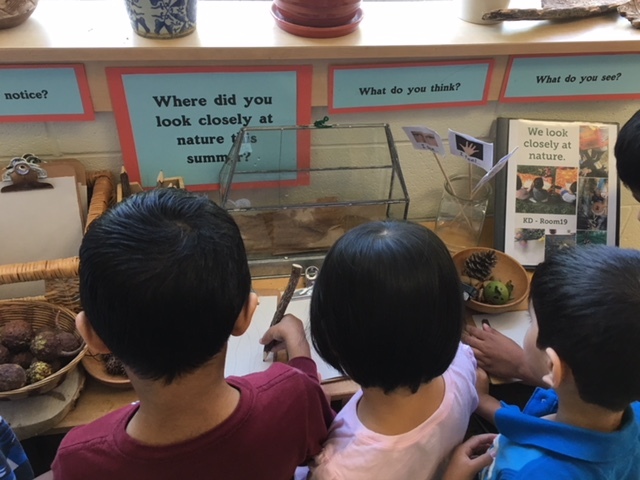 As in past years, our class participated in the #KindergartenBioBlitz weeks in fall, winter, and spring, helping to form a culture of looking closely and noticing nature in our class. Students drawing pillbugs we'd collected outdoors (in our "catch and release" glass house); this "looking closely at nature" area from the first day of school gave students a place to collect and observe interesting nature artifacts. All this is preamble to share a very small moment in time: a gift that came to us on an invisible string. This beautiful day at the end of May, we headed out to the meadow lugging the "wonder wagon" (our cart with various tools for investigating and recording nature observations). Late in the fall we had adopted a tree in the meadow as our own; it was a newly-planted maple with slim trunk. It won out over other favourites, including the magnificent weeping willow that towers overhead. 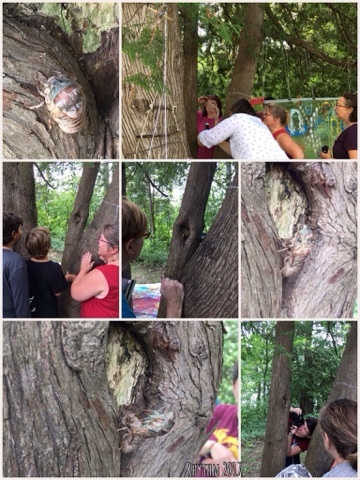 Each time we walked the path into this space, several students would run to greet their favourite tree in the space. This time, there was a gift awaiting us. It dangled, bobbing and twirling, on its invisible thread. A small, green caterpillar cradling a white ball of silk, dancing in the breeze as it hung from the willow tree. 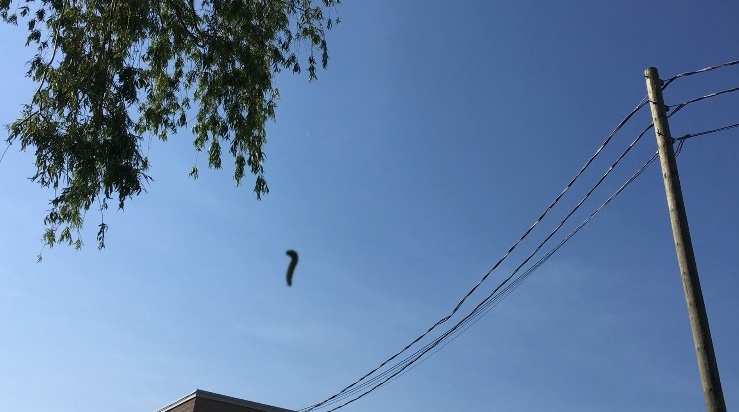 The caterpillar swung from a swaying branch. We gathered in a circle to observe. I managed to capture a tiny snippet of the action without also capturing student faces or identifying features. Instead of embedding I've included these videos as links below, to open in a separate window ( a friendlier format for those reading on various devices). The caterpillar dances over our heads. What happened next surprised us all. Both teachers turned away for a moment, each of us to talk to different students. When we turned back, the caterpillar was gone. We looked all around, but saw only stunned faces, and a few hands pointing to where the caterpillar had been. "What happened?" "Where is it?" asked those of us who'd looked away. The answers tumbled out of several students all at once. As it turns out, a bird had swooped down and grabbed the thing right out of the air, flying away without stopping. 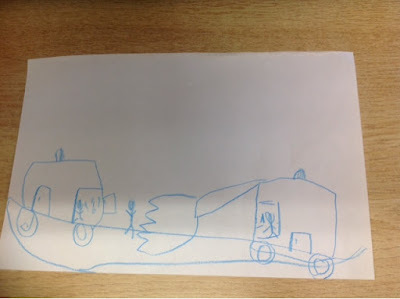 I did my best to capture their explanations, and then because I was delighted by the turn of events but horrified that I'd missed it, I asked if any of them could draw a picture or diagram to show me how it happened. The clipboards and drawing materials were sorted out in a hurry. Students asked to tweet our friend and favourite "nature expert", Rob Ridley. This is the story, illustrated and described by the witnesses. What truly shone in this moment was the intimate knowledge of our environment, and the communication skills of these different learners. Each picture captures important details of that split-second moment in time. 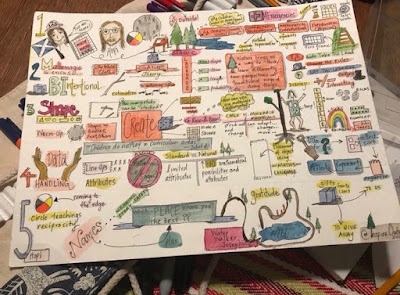 By focusing on drawing, equally or perhaps even more than writing, our students became quite skilled at expressing events, opinions, desires, and other ideas. 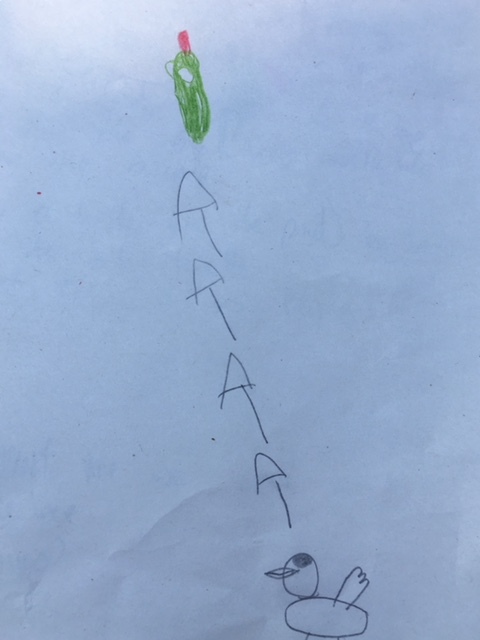 I should note that several students later added words to their initial drawings, from simple one-word labels to titles and short sentences describing the action. It is the drawing, however, that told us so much about what they noticed. This dramatic scene was over in the blink of an eye. 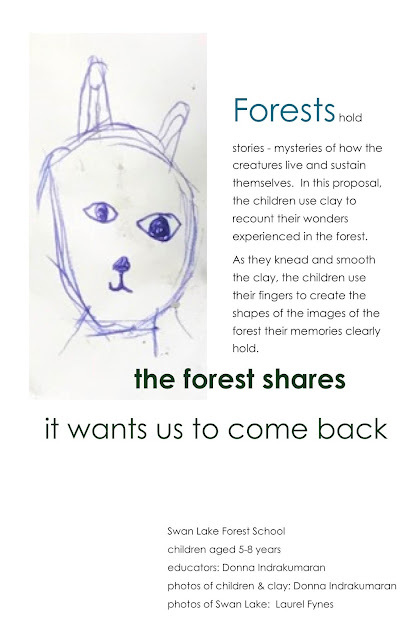 What students chose to share, and how they expressed it, demonstrated some amazing creativity and knowledge of text conventions. Paraphrased explanation: the "string" is blue because like water, it was invisible but can also look blue in drawings. An extreme close-up detailed the size difference of the two creatures, as well as allowing room to add the pertinent detail R noticed about the caterpillar: faint lines along the body and the white ball of silk near its head. 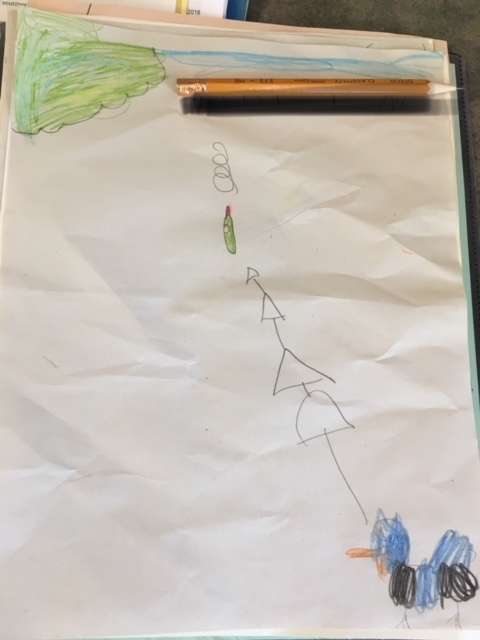 "I drew a map of where the bird was going." "The bird flew up and the caterpillar was spinning, spinning..."
AK (whose description is included in the collage above) was quite affected by witnessing the suprising event. The next day in class he suggested, "We should put something in the tree so everyone knows what the bird wants. The bird wants a caterpillar. I think the bird is hungry for the caterpillar. They have babies and they want to eat them and bring them to their nest." Later, while holding a tiny beetle in his hand, AK remembered the event again, "I don't want it on my hand. The bird is going to get on my hand because he wants the bug." This gift of a surprise turning into study is the best demonstration of a curiosity-driven curriculum I can think of. The thinking behind their illustrations, also the connections students made in order to identify the bird, and to why he swooped down like that... all tie into the importance of slowing down, noticing nature, and wondering together. As I was writing, I paused to find more tweets from that day. 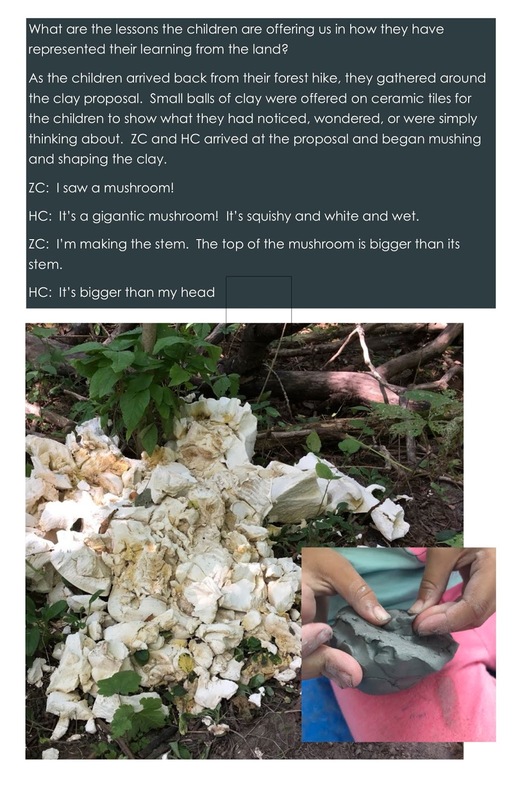 I noticed a tweet from a friend who teaches older students, but none-the-less often inspires me in my own practice due to her use of an environmental education lens. This was exactly what I was writing about, without realizing what made that moment so illustrative of the year: it was the way children pulled their knowledge from our year together to make a whole story to share with our families and friends. 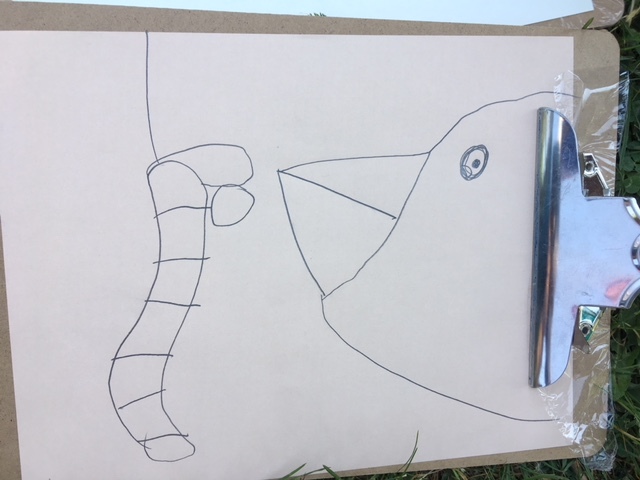 The student who identified the bird as a red-winged blackbird, remembering details he'd learn in his many hours (overall) spent watching visitors to our window feeders and reading field guides. The student who used her knowledge of motion lines. The student who inspired others to use arrows to indicate "mapping". The student who surprised us with the unique perspective in the close-up drawing of the bird. 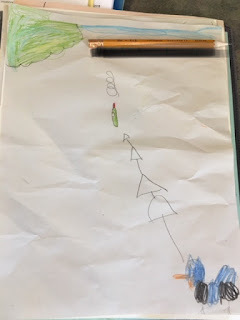 The student who included herself and her friend in her picture, to describe how shocked they were as they witnessed the event, and also added the fluffy snowflake-like seeds of the cottonwood tree which blew over us later that same morning. 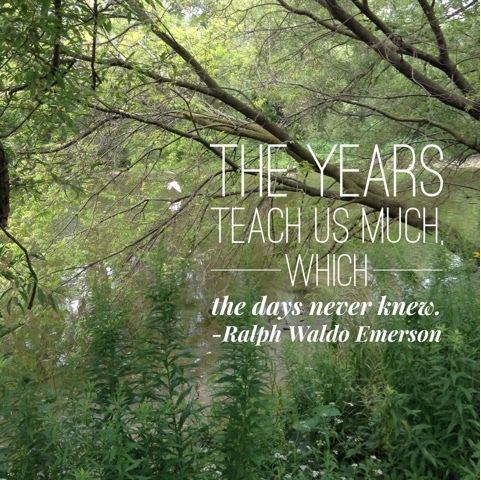 These were seeds planted over the year of joyous curiosity in the outdoors. Thank you Emily for helping me see that. If you wish, leave a comment about a moment that has left an impact on your class. Wednesday afternoon I joined the forest school children and teachers for lunch. 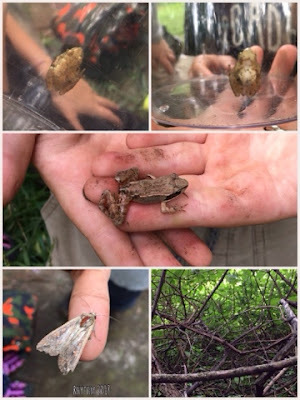 I was delighted to follow them around the meadow that they already knew so well after only two days, seeing the lovely wood frogs they caught (and then released), one of several moths flitting about the grass, and other tiny wonders. 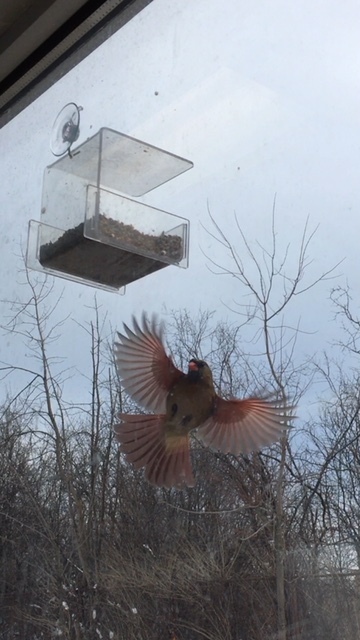 I shared my trick for calling songbirds down closer, or "pishing" and told how I love listening to birds wherever I go. I was touched, then, when T asked me, "Do you want to hear the most beautiful sound in the forest?" to which the only possible answer is, "Yes! Lead the way!" In the deep green veil of leaves (bottom right cormer of the collage) we marvelled at the loudness of the cricket chorus. I was indeed the most beautiful thing. I was honoured. Today was the third day of the fifth annual, week-long "Rhythm of Learning in Nature" summer intensive course. It is my fifth year in attendance, my daughter's third year of attending the forest school, and my second year of attending as a facilitator for the week. I've written about the deeply immersive experience before, from a very different perspective. I was just finishing my first year at a new school, Thornwood PS, and was writing my observations throughout the week as this entirely new sort of professional experience unfolded. I knew something amazing was happening, but I didn't yet know how important it would be for me, over the year, to reflect on those five days and find inspiration and support from fellow learners who'd become friends. The day began with a chance to reconnect over breakfast, after which we headed outside to the lawn overlooking Swan Lake. Art invitations were set all about the small yard. There weren't instructions or expectations to visit each one. Already, the freedom to explore as broadly or narrowly as we wanted set this apart from professional gatherings many of us have attended in the past - I heard more than one person comment to this effect today, and over the last two days. I'm not sure what I was doing at the time (watching others trace faces at the vertical painting, grinding herbs in the mortar and pestles) but suddenly I was called to come see an interesting insect that Alex had found on the ground. I immediately recognized the hard carapace of a cicada, something my students and my own kids have collected with me over the years. Then I saw that it wasn't a carapace, but in fact moving... it was a cicada that had just dug its way up from under the tree, and was likely knocked down from its climb by the ropes used to hang the vertical painting easel. I may have screamed, I was so excited. 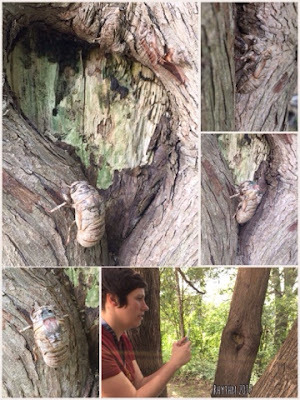 I remember the forest school children calling me last year to show me the newly emerged cicada they'd found, hours later in the process than this hard-shelled critter clinging to the branch in my hand. I remember the awe as we watched it grow before our eyes... and here we were, able to witness it from the shell. This was magical, for lack of a better word, because it was really the exact opposite of magic. It was deeply mundane, and wonderful. The cicada had likely fallen from the cedar tree, so I placed it in the crook of two branches where it would be safe from all of our feet. It immediately began to crawl up the bark of the trunk. 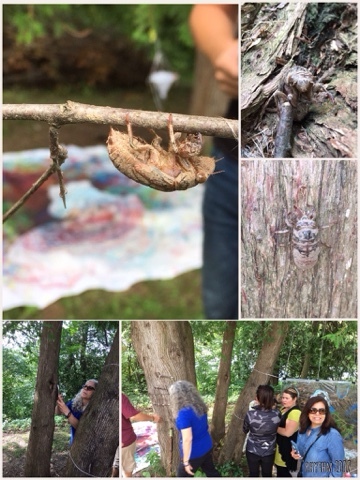 More and more of us watched as the prehistoric-looking insect clung to the tree on its way to metamorphosize. The cicada came to a rest in the grown-over hole where a limb had been cut. It seemed to anchor itself with a tight grip, and then was still, until it began to jiggle and dance. We wondered if perhaps it was pulling its legs from within the shell, like we might shake off heavy rubber boots or thick tights. 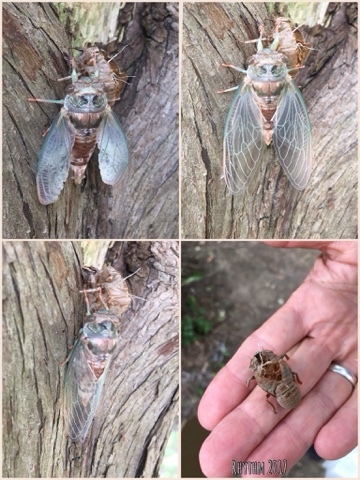 I knew from seeing later stage cicada emergence last year with the forest school children that it would leave through a hole in the back, so I let everyone who would listen know to watch for this to begin. We saw the shape change (the back seemed to arch) but it wasn't until the colour subtly changed and the insect inside began to pulse (or breathe?) that we noticed it had already split its back. It had already been at least an hour since we'd seen the shelled cicada climb up the tree, but it was still riveting. In front of our eyes we saw the creature pulse, shake, grow, arch, push, stretch its legs, and lean way out of its hard shell. No wings were visible yet, but the colour was brighter now, and the pale eyes had darkened. It was magical to watch. Many of us exclaimed how lucky we were to be present to see this unfold. Now the wings unfolded and began to pulse as the green blood flowed through the silvery veins. This process was even more magical, somehow, though the sheer effort of getting out and to this stage left us in awe. The wings stretched out to full, then a few moments later, the cicada folded them neatly along the sides of its body. This happened just before we sat down for our discussion. After we spoke, we noticed that it was now gone, perhaps adding its buzz to the chorus we heard in the trees around us. All that remained was the hard shell. Everyone's words touched me, left me thinking about my new year (new school, new team) and what matters most to me in teaching children. Erin, however, touched me particularly because she shared both her love of what she does and the children she works with, but also how incredibly hard and draining the last year was. I understood only too well how it feels to want to BE more, to DO more when our students need more of our us (some years there's more mothering involved, and even more support of the family at home). I understood how difficult it is to express the feeling of needing a break (whether a day off when sick, time away from documentation and reporting when home with family) but also feeling the need to carry the weight for the sake of the children and families we have such a strong connection with. Nadine responded with kindness and understanding: "It is a draining position because we give so much. It is restorative too; I learn and gain so much from the kids. " We give because we feel the need, and because it is joyful. It was something said in a place that was safe to express this feeling - at school we hold our head high and smile at every child, our own or in other classes, to show we are happy to see them. We are available, attentive, delighted, respectful, engaged, inspired. It is the most wonderful job there is, one I feel incredibly lucky to grow in every day. It is full of wonder, and joy. It is also full of intense emotions, and our role as supporting children to regulate those (and over time self-regulate throughout their day) requires us to constantly up- or down- regulate to meet the needs of our many learners. It is rewarding. It is also, at times, some years more than others, exhausting, and in order to keep the classroom community a safe place to learn, we show our best self every day. We hold our lamp aloft and shine. This is easier to do when the entire class team enjoy each other and when students come to school feeling ready to join in and learn. This isn't always the case, and when needs must be met in order for children to be able to join in (lack of food, sleep, comfortable clothing for all weather, or other lack) we as teachers naturally must slow down and meet the children where they are. If we can support our teaching partners, share the load (especially in large classes), make each other laugh, help each solve day-to-day problems, we can't help but feel we have the best job in world. But it is possible to give our light away, and burn down in the process... if too much is asked, or the entire load not shared. So what does coming together to play, to share joy with others (old friends and brand new acquaintances) do for us? We shine our light together, and rekindle those whose lamps are low. It is so much more than learning new skills, techniques, or ideas about pedagogy that brings us back every year. Like the cicada, we are reborn here. We are pushing through, shaking off our armour, the shield we need to keep strong, but also armour that we carry from our idealized image of how we should be as teachers. Here we push through, shake off the shell and trust that the time and space will be perfect, for us to spread our wings, and like the cicada, to sing the song we've been waiting to sing. Why do we feel such connection to this place, to this group of people, some of whom were strangers only two days ago? The cicada lives underground, under the roots of a tree, for most of its life. It has but a few days with which to emerge (moult), unfold its wings, fly, and "sing" (though not singing as we know it because its more like a rattle in their hind end). The time has to be just right - when the connection to others of its kind are possible. Once it climbs up above ground and begins its climb, it can't turn back. Likewise, in this company in the slowed-down time spend engaging in emerging play in nature, we just have to open and trust that we've picked the right time, and space. We live our lives underground? No, that's not quite right. We do, however, keep our feelings underground while in our professional lives. Educators need the trust of parents, fellow educators, and above all our students, in order to be able to create a classroom learning community. We don't feel able to show vulnerability, instead we project our best, most strong self to welcome others in our classrooms. But educators on a journey of pedagogical learning can be lonely, disconnected from other grades (whose classes hum along at an entirely different rhythm than those of early years classes). We can feel disconnected from others like us, who see and hear the magic of children and who hold in our hearts the image of ourselves as learners, too. We work in our spaces, safe in our armour. We show outwardly that we are capable, not vulnerable; knowledgeable, not full of doubt about what we know and believed important. But at Swan Lake, at Rhythm, we may climb up, root our feet deeply in a trusted place, steady ourselves and begin to dance... we push out against our binds... the memories of our long time underground released, our wings unfurling as we breathe deeply, release the emotion of deep connection... and we may "sing" our song. Thank you, cicada, for sharing your beautiful journey with us. A beautiful moment I was honoured to share with the children at the forest school at last year's Rhythm of Learning in Nature summer intensive course. The kids had come to get me (perhaps at my daughter's urging, or simply because I was the one who always loved to look closely at any small creatures when with them) when they noticed what was happening, and I was able to witness (and document) the wondrous event with them. There are few trees more iconic that the graceful weeping willow tree. It is immortalized in art, poetry and music, used to symbolize emotion (longing, grief) and ideals (strength in flexibility). It has long been a symbol of survival: unlike the mighty oak which may snap in two in a windstorm, the weeping willow bends, yields and thus remains unbroken. 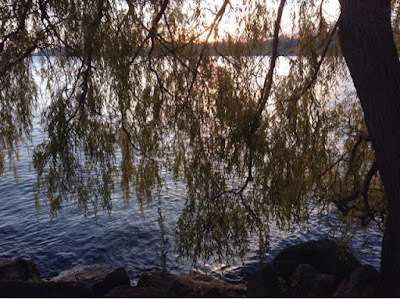 For me, the weeping willow has more personal meaning, tied to early memories. When I was three years old, my family moved to the property my parents live still. It was one of many ten-acre plots, once part of a larger farm that spread a few concessions long. Most of the mature trees were found along the fence rows: a huge cherry on the south fence where a snowy owl once perched when I was a kid, maples along the east, a grand old pine near the road, and a number of old apple trees. The house my parents helped design was build in the middle of the property, high up on a hill overlooking the road and facing west with a fantastic view of sunsets (before the trees grew in and obscured much of the view). My parents had a pond dug on the land down below the house, where a creek and plentiful, fragrant balm of gilead trees alerted us to water. I spent summers swimming in that goldfish-filled pond, and winters skating on it. Over the next few years we planted some 2000 trees, so that a forest now spreads on three sides of the house. When I walk the trails through those woods, I often spot evidence of wildlife who share the space: turkeys, deer, rabbits, songbirds and raptors, mushrooms and flowering plants. What stands out, though, is the magnificent weeping willow that droops over the pond. My mom stuck a willow switch in the ground after the pond was dug out, marking the spot where she wished to plant a tree. Being a willow, it quickly rooted and my mom's wish came true, with no more work needed. Every summer from that tree, the red-wing blackbirds scolded us and kingfishers dazzled us with their acrobatic fishing skills. We hid beneath the drooping boughs, swung from the thicker branches like Tarzan on vines, and used the fallen switches for bending bracelets or weaving. It was, and is, a most beloved tree. The trailing boughs of one of many weeping willows that line a lakefront park nearby. This beautiful tree is so ubiquitous, it's hard to imagine a time when they weren't growing everywhere in Ontario. Many moments and memories tangled when I first thought to write this story. It was a powerful metaphor that struck me: the history of one of our most iconic trees was tied to the silk road and the very area of the world that many of our refugee students and their families had recently fled. I thought about the ugly backlash some communities saw when even small numbers of newcomers moved into the neighbourhood and the schools. I was grateful to work in a school where the opposite was true: where the community rallied to support our new families with translators, services, orientation sessions and invitations to local events. Our class had been diverse before, with speakers of varieties of Arabic, Urdu, Hindu, Tamil, Vietnamese, Marathi, Mandarin and more. For many years I've used inclusive practices in my teaching, from creating multi-lingual class books each year and using students' languages in our meeting times (while counting, greeting each other) to inviting students to learn about each others' celebrations and traditions that share similarities with their own (such as the use of light in many winter ceremonies). This year, however, it felt necessary to do more, to go beyond sharing our differences. These families had been living through a series of months, even years, "on hold". They were facing challenges greater than most families at our school. Since last winter, our community grew as many newcomers from Syria began to move into the valley around Cooksville Creek. Our school grew by 100+ students who were "uprooted" along with their families, and this year in our class there are five students whose long journeys from Syria have brought them here to Ontario. It was important to me to ensure they felt a sense of belonging in our school. When I read the story of the tree a few months ago, it stuck with me. That Monday back at school, I looked at EA, the first of the newly arrived students to join our class as a junior student last year, back in January. I thought of how far she'd come, and how much she'd grown in the months since her first day. She'd arrived on a very snowy day, and I was grateful for the beautiful weather. We spent quite a long time outdoors that day, introducing her to the joys of playing in the snow with new friends. We explored the snow forts build by older students at recess, and took our sleds to the hill behind the school where we all took turns riding with her or pushing her sled from the top of the hill. We rolled down snowbanks and stomped fresh tracks into the untouched field by the park. It was the perfect way to welcome a student whose language most of us didn't share. I remember her rosy cheeks and brilliant smile on that day. It didn't take long before she was conversing with us in a mixture of Arabic and English. She taught me many words (including the names for our shared snack foods, but that will be another post). Soon after her arrival, two more students joined us from Syria, and she was an excellent support. She translated for her new friends and her teachers, all while her command of English grew. I was delighted to see her grow in confidence. So the story of the willow was my gift to her. She had drawn a Syrian flag a few weeks before, and it inspired another student to make one as well. It inspired others in class, and resulted in a space on the bulletin board under the banner "Our Flags" where first a few countries were represented (as in the photo below, taken in December) but where now many more flags are shown. She later painted a Canada flag, again from memory (not from looking at a sample, thus the red bars along the top as well as the sides). It was then that I remembered what I'd read about weeping willow trees. I took her to the window and gave her a step stool so she could see the towering tree across the road beside the driveway to our school. I told her how I'd just learned how those amazing trees weren't native to Canada, but instead a transplant from far away. I told her how one of those very trees was brought from Syria to make its new home beautiful, and that she was just like that tree - brought here while small, growing somewhere new to become part of our rich and varied forest. I said that she and her family would make Canada more beautiful too. She didn't say much, then. In the months since that day, however, she has pointed at it, the pale golden giant that blows in the breeze, and asked me to tell her the story again. 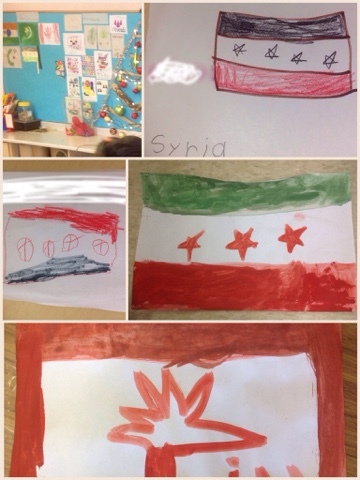 EA's Syrian flag, top right, inspired others to make flags representing their families' home countries. I didn't realize at first why the Syrian students drew the flags differently (black with red, green with red) but later discovered that the design is contested and thus several versions are currently in use. EA also painted the flag of Canada, seen at the bottom. An interest in flags continues in class, with more added each week as more students add their own. EA's story is what caused me to, for the nth time, look at the breadth of tree inquiry in my class over time. Every year we adopt a tree it becomes more meaningful, as younger siblings remember past trees adopted and visited by their older siblings over the summer. The sheer amount of stories tied to these inquiries has kept me from starting to write about them - every time I think I have the beginning or the end, I realize I'm wrong, that there's much more learning involved. It feels like roots, all tangled beneath the soil and purported to amount to more biomass than the huge tree above the ground. So I won't attempt to pull it all up, untangle and make sense of it. Well, maybe just a bit of it. 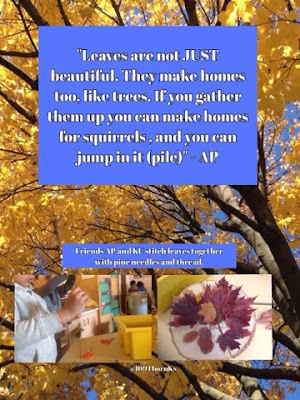 Over the five years I've taught at Thornwood PS, the trees have been a part of our curriculum in different ways. 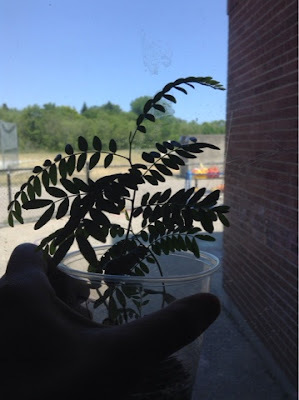 We have adopted trees, studying them daily, noting the amazing changes that occur all through the year. We have explored felled trees beyond the park, posing for pictures and challenging ourselves to balance along their length. We have smelled blossoms and tasted wild apples that grew along the edge of the creek that borders our school beyond the driveway. We have gathered pine cones, acorns, catkins and "shaker" seed pods. 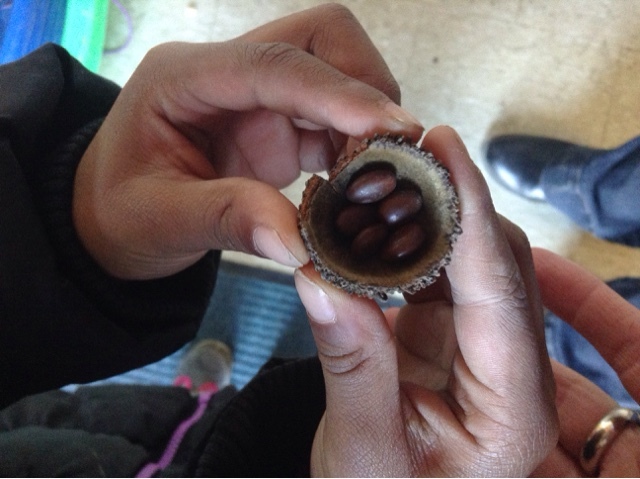 We sprouted seeds from a broken seed pod that came from the tree our class adopted last year, and those seedlings now overwinter in my parents' garden until I can take them back to school in the spring. Those seedlings are most important this year, because of the reconstruction project along the creek that resulted in the removal of 100 of small trees, including the apples we watched grow every year. Those students who reveled in the shade of those trees at the end of the year last summer were as stunned as I was to return to school to see them gone. Small, perhaps, in comparison to the loss of whole forests or entire neighbourhoods (as some of my students have witnessed) but a poignant loss none-the-less. In encouraging students to look closely and know their local environment, I hope to grow a pedagogy of place: an ever-deepening connection to the life overhead and underfoot. A view of the no-mow zone at the beginning of fall. A group of students carry clipboards as we go for a walk one day two years ago, gathering images and samples (bark rubbings, leaves, needles, acorns) for our list of favourite local trees. We narrowed the list down to ten for closer inspection and research before finally choosing our tree to adopt for the year. A student reaches to grab the apple and bring it close to smell. This tree was a favourite to visit in spring because of its fragrant, showy blossoms, but only a few fruit grew to ripen. 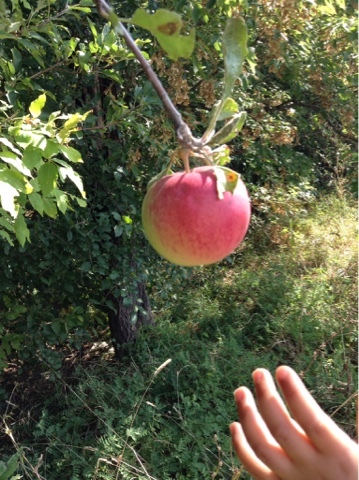 We managed to pick one apple that we washed and tasted that day a few years ago. A question first, to inspire us to look closely at the trees in our area. This was fall last year. In the middle-left is pictured the path on the opposite side of the creek (our school is on the left, out of view). This path is now off-limits while the creek is revitalized. The pictures around it represent trees that still stand, on the far side of the path or in the park. We hope to visit them again before the end of the year, if the pedestrian bridge is reopened by then. A deep connection made to the maple trees in our nearby park. One of our proud "tree experts" hard at work last summer, identifying trees all around our adopted tree that he had identified back in the fall. He had delighted me by proving me wrong: I'd guessed black locust, but he was correct in calling it a honey locust. Back in the fall we gathered hundreds of curly seed pods under our tree, using them as shakers, ornaments, and additions to our loose parts creations. These seeds, gathered last April from a broken pod beneath our locust tree and lovingly carried all the way back to class by TC in a large acorn cap, were later planted by T when the rest of the class planted green beans as a part of a gardening project. To our surprise and delight, her tree seeds sprouted and grew. TC's seedlings growing tall, in June. She left them at school on the last day, and I couldn't bring myself to leave them to die. I brought them home and transplanted them. In spring we will see if they've survived winter, and perhaps find a place to plant them on or around the school grounds. 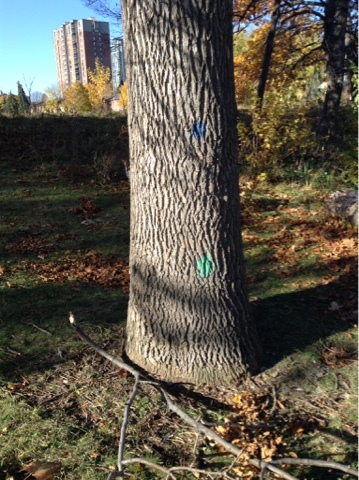 Eco-literacy: students were concerned about these markings showing up on many trees in the area along the creek. We tweeted several experts and did a little research to reveal that different regions use different markings, but that most likely this tree was marked as "healthy, do no cut", while those marked with orange were to be removed. Their concern was for individual trees, for we didn't yet know the extent of the project that would soon fence off our creek and result in wide-spread removal. A view of the no-mow zone last June. Behind the trees is Cooksville Creek, then a concrete-bottom waterway prone to flooding the field and our school. Little did we know that these few last weeks of school would be the last time we would enjoy this lively green wall that hid the water and houses on the other side. Our last month of school last June was spent exploring the rich life of summer outdoors. We noticed the fence spring up in the yard, cutting us off from the trees and dividing our no-mow zone in half. None of us imagined that we'd soon see right across the creek. It's hard to reconcile this view with the photo above, but this was taken a few months later just beyond the no-mow zone, looking across the expanse where there was once a creek (now running through the black pipe beside the fence) and trees sloping down on both sides. We were watching the bulldozer push a bundle of uprooted trees while listening to the rush of the water in the pipe. Another angle, looking further along the creek near the park. 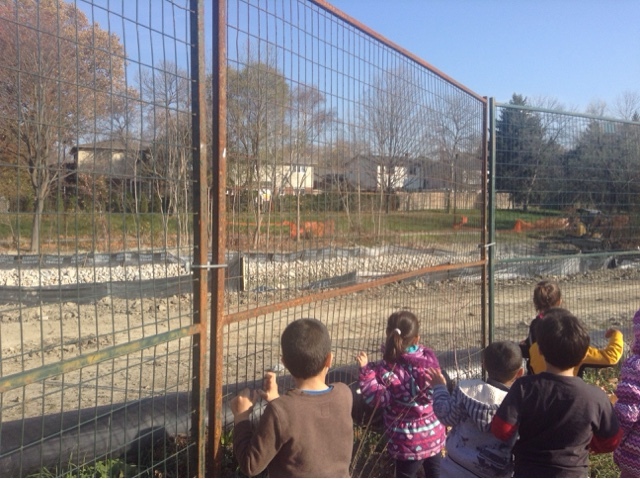 We spoke to friendly workers who gladly explained what they were doing, but it was difficult for the students to see how this big mess was actually going to make the creek a healthier one. We look forward to the reconstructed, naturalized creek banks and the eventual reopening of the path we used to take when we visited our favourite trees. One student's illustration of the work we saw as we watched the heavy machinery and hard-hatted workers one day. This picture is one of many that help explain children's thinking about our creek inquiry, an ongoing exploration of water, the creatures we once saw living in the creek, and the need to take care of our earth. 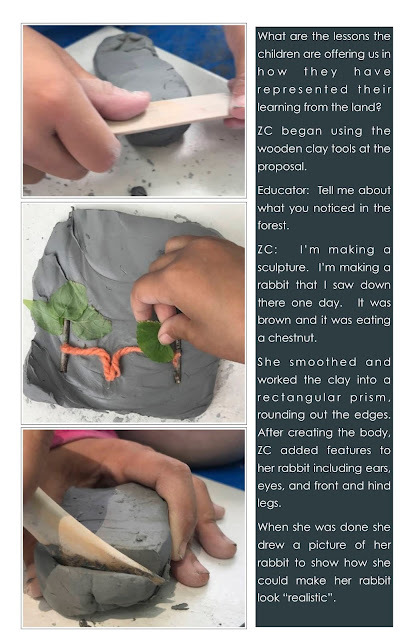 That story will be another post, as it continues to grow in our class. 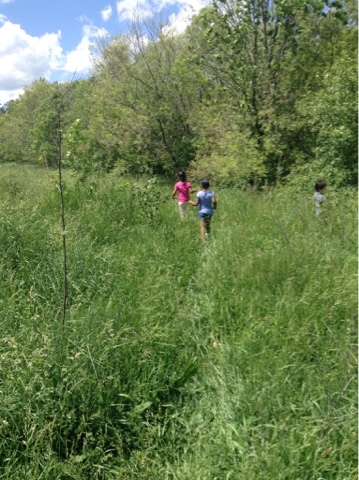 A group of us went for a walk while the rest of the class played back in our yard. We had stopped to watch the machinery rumble by us, then found a pile of discarded branches that we on our side of the fence. It was a memory of past trips for senior students who recalled the deep shade and places to hide that once existed here, at the edge of the park. For junior students who had no such memories, it was simply a time to explore and enjoy collaboration while we attempted to make an impromptu fort. 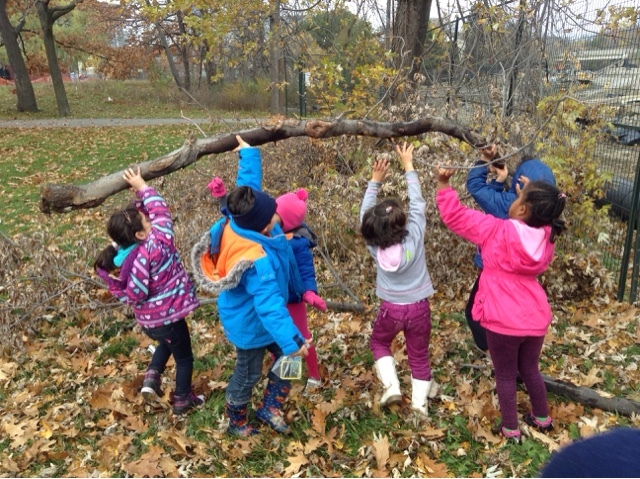 EA was in the group, happily tossing leaves in the air and gathering sticks and branches for building. It seems poetic now, looking at this photo: the landscape changing but new life growing all around. We will continue to visit as we can, and watch for signs of new life. 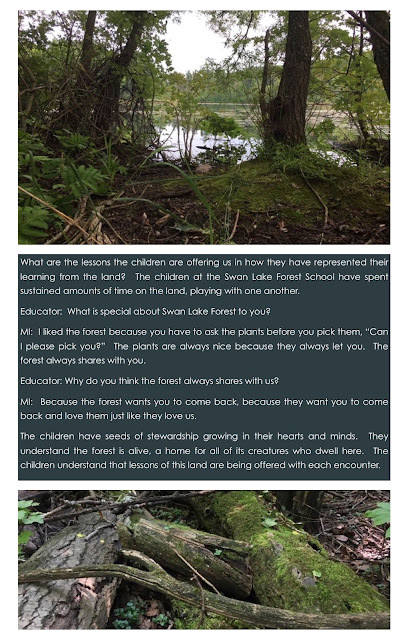 I think of how much the land around the school has been a part of our learning, and how the stories of our adventures on the grounds help students feel ownership over the place. It is my hope that it leads to lifelong stewardship, no matter where they go. 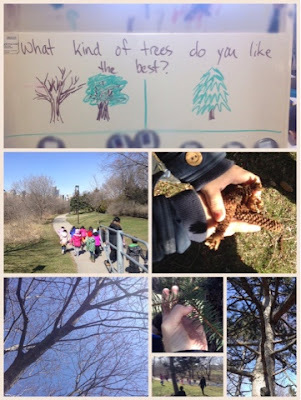 I looked over the years of #treeinquiry in our class, and saw it had a greater impact than I had realized. This fall, when I saw the size of the project underway to solve the flooding of our valley, I reached out to a few local experts to see if they would be willing to come and speak to my class about what was happening with the creek and the surrounding wildlife. We had an initial response with a contact name, and hope to follow up with a visit in spring. While creek inquiry continues this year, I couldn't help but notice how much the connection to our local trees has impacted students in all of my classes, from those early half-day years, to the last three full-day classes shared with a teaching partner. Here are a few memories from the last few years. 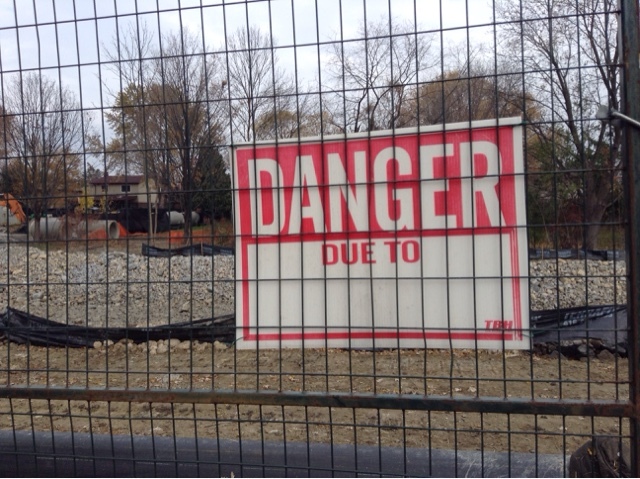 The first image is particularly poignant as it shows the area that is now fenced and bare (very close to where the "danger" sign in the photo above). 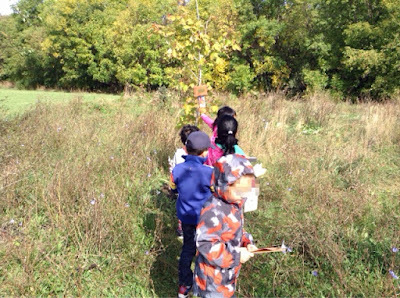 A little history is helpful to understand the next few tweets: while the PM class had adopted the apple tree pictured above, the AM class had chosen the large silver maple right at the front steps of the school. During the winter break we were struck by a massive ice storm which caused widespread power outages and damage to trees. I went to school on the break to visit, concerned that our trees had been broken like so many others around us. After sharing the good news below, I was touched to receive a tweet from the family of one of my students, who'd asked her father to check on our tree as well. I knew then that she would be a caring steward of the world around her. Though she's since moved to a new school, I wonder if she remembers those trips to visit her tree. @yusraamir1 that makes me happy, too. I worried about our trees, & about my friends who were away ill in Dec. Happy Holidays, see you soon! A nearly-hidden egret (the large white heron) flies over the shallow water of Etobicoke Creek. I think I startled it when I came close to the edge of the water. This quote speaks to me of the learning we gain slowly by observing, as opposed to those lightbulb "aha" moments of discovery. Both ways of learning are important, and will help us understand our world. To know a tree, to see something grow that will live long beyond our years, is to learn our place in nature. 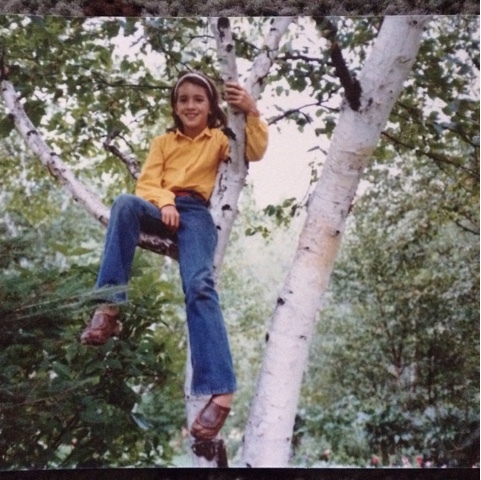 My mom didn't have any photos of us playing in the willow tree, but my grandmother passed down many photos from my summers spent visiting her in Timmins. My grandmother is no longer alive and the house was sold long ago, but I remember eating many things from the garden that grew in the back, behind the birch, and I remember the sound of ravens in the forest further beyond. I wonder what memories my students will have of living and growing with trees.